Joyce Napuat knows first hand what it’s like to live with a disability. Born with one leg on the island of Tanna, she’s had to overcome many challenges throughout her life. Growing up, Joyce had to walk on crutches over long distances of rugged terrain simply to get to school. But despite coming from an extremely marginalized background, she pursued her education with the support of her grandmother, going on to secondary school and then studying business management at the Vanuatu Institute of Technology. Today, the 31-year-old is recognised as a pioneer in promoting the rights of people with disabilities and inclusive practices. 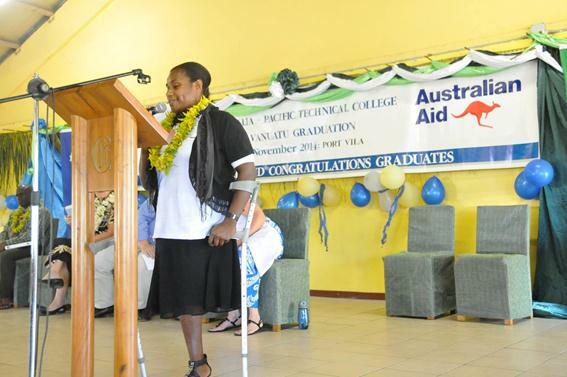 “Joyce has been leading the way to not only change knowledge, attitudes and practices of decision makers but has worked tirelessly at all levels, to promote the rights of people with disabilities to be included in every facet of life,” says Marguerite Anne Goulding, a former Education Adviser with Vanuatu Ministry of Education and Training. “Joyce has inspired other women with disability, who never thought they would go to school, pursue an education and employment,” she adds. Joyce is continually engaged with mothers (and families) who have children with disabilities and advises about, and directs them to, myriad resources to enable their children to have access to inclusive education. Many children with disability are now attending school and other social and educative programs due to Joyce’s advocacy and direction. ‘Everybody has the right to quality inclusive education,’ she says. 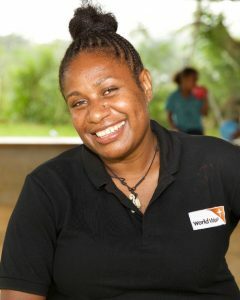 Joyce’s inspiring story extends to her professional career demonstrated by her holding positions with a variety of organisations including World Vision, the Vanuatu Disabled People’s Society and Oxfam. In her role as Community Coordinator with World Vision, Joyce was responsible for promoting the importance of Early Childhood Care and Education, especially early identification of and intervention for children with disability. In her current role as Development Facilitator with World Vision, Joyce promotes gender equality, works to reduce gender based violence and advocates for the rights of women with disabilities. Joyce is also a respected member of the Vanuatu Disability Network and has represented people with disabilities at national and international forums. Joyce has won coveted awards including the Andy Lynch Award for Excellence in the Community Sector in 2014 for her exemplary work in the disability sector. She’s a much sought after guest speaker at training sessions and special events including graduation ceremonies. In addition to her professional and advocacy roles, Joyce is a loving and caring mother to her four-year-old son, and a role model in her parenting style for other parents with disability.